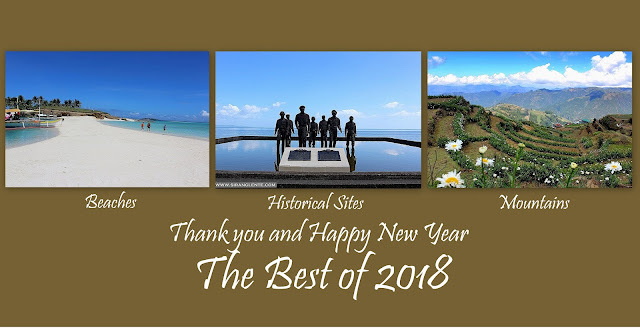 Let's accept the reality that when Boracay island was closed, the other comparable beaches were recognized - Maniwaya Island in Marinduque is one of those. The province of Marinduque is considered the heart of the Philippine archipelago and the neighbor of my hometown - Romblon. Gorgeous images of this island spread on social media which captured my interest. There's fine white sand beaches, amazing landscape, crystal clear water, vast diversity of underwater creatures and many more; photos below will explain more. It's been a long long time when I started dreaming of visiting Maniwaya, however, due to unavoidable circumstances in my life, it remained a dream. A text message from my friend, Shea, made that dream a reality. It was just a plain question: "nakarating kanaba sa Marinduque?" and I responded: "Hindi pa, bakit?" Then, she sent to me an event itinerary. I read it and that's it! We filed a leave for this event. Life changing yung pangyayari no??? We met Sir Joey, Justin, and the other participants at a fast-food chain in Quezon Ave, wag nating sabihing "sa McDo," pero dun nga. Manila ETD: 0015. General Luna ETA: 0500. What's remarkable about our travel? Siguro yung nakailang untog ako sa upuan dahil sa liko-likong kalsada. What's my challenge? I think it's my long legs. There's a parking area for private vehicles and market and food stalls near General Luna Port. Upon arrival, we had our breakfast at the carinderia by the port and waited for our bangkero. It was weekend, so, a lot of visitors were also waiting! Sabi nga nila, "patience is a virtue." Our chartered boat was unable to go nearer because it was low tide. Instead of dipping our feet into the water, we rode on a small boat that brought us to Lady Sparks - our chartered boat; we're sixteen and it's enough. Travel time from General Luna Port to Maniwaya Island is 40 minutes to an hour. The sea was calm, compared to our 3 hours travel from Alibijaban to Burias Group of Islands. From afar, the sun drenched island greets all the visitors with white sand shoreline and the landscape is just pleasing in the eyes. After getting off the boat and started walking on the sand, I easily felt the cool and fresh air, and saw the shoreline with powdery white sand. While the visitors are not yet jam-packed, we proceeded to Wawies Beach Resort and chose the perfect spot - tent by the sea! AT WAWIES BEACH RESORT: For our accommodation, we stayed in an orange tent. Did you know that in Wawies Beach resort, they only have orange and blue tents??? Akala nyo si Kuya Kim no? Anyways, Wawies has tent and cottage accommodations. For facilities, they have an open dinning hall, grilling station, toilet and shower area. Reminders: Electricity is produced via generator set, so expect for power interruption and water supply is not available from 7PM to 10PM. While the others were by the camp, I and Shea had a walk by the beach, to the other side. We were stunned by the clarity of the water surrounding the island - it is perfect for picnic and swimming. Plus, the tranquility and the cool wind just made it a relaxing day. While walking, before heading back to the camp, we had a short halo-halo break for only 30 pesos. We dipped into the water when the sun is having its final walk. Tidy up. Had our dinner and socials by the shore. It was a long long but relaxing day! We arrived in Maniwaya at around 8 AM, lunch break and sunset viewing at around 6 PM. Imagine the ten hours of starring on the emerald seas and crystal clear waters, taking photos of the breathtaking landscape on the island, playing with the fine white sand mixed with variety of sea shells and crustaceans while listening to my playlist - absolutely a lazy afternoon! Nakakalungkot lang talaga, we woke up early in the morning to see the beautiful and artistic shape of Palad Sandbar, however, the weather was unfriendly and the sandbar was hidden during our visit. Expected ko pa namang makita s'ya, pero umasa lang ako - at masakit! I was sleeping on the boat while the others were enjoying the waves. We stayed there for almost an hour and proceeded to our next destination. Our next destination was Ungab Rock Formation in Mongpong Island. From afar, this rock formation seems to be the same with the other normal rock formations by the sea I've seen. When our boat docked on the shore, I felt hungry while getting off the boat so, we chose food first than taking photos. Rested for few minutes habang pinag-uusapan namin yung ibang mga tao sa paligid, bait namin no? It was hard to take photos because a lot of visitors were by the rock formation, others were inside, and the others were still waiting on the shore for their time. For more videos, click here and Subscribe! After Ungab Rock formation, we headed back to Maniwaya. Akala namin talaga Maniwaya na, pero hindi pala; our bangkero brought us to General Luna Port, thinking that we are heading back to Manila. 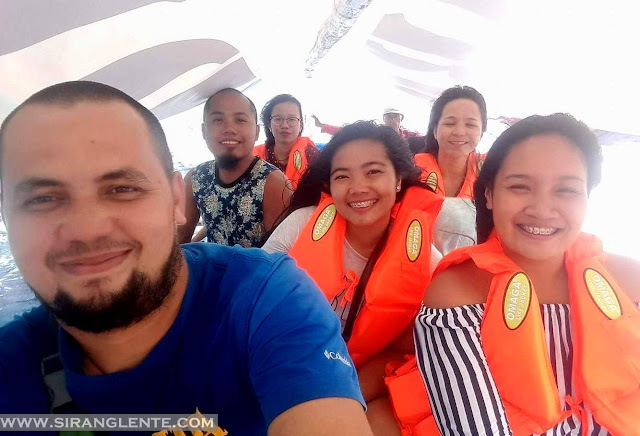 So ayun, mas humaba ang aming bonding on the water. Humaba ang travel time at pagod-pagud, pero happy naman ako. Ako lang, diko lang alam sa iba. Upon arrival in Maniwaya, had our lunch, tidy up and headed back to General Luna Port - Part 2. On the second time, the waves became harder and harder and harder. Kalowka! An-lakas talaga ng alon at ang tataas nila. Alam nyo yung feeling na bihis na bihis ka na pabalik ng Maynila, tapos Please see the video above, as proof. To Sir Joey, our event coordinator, thank you for everything! Parang naiiyak ako sa part na ito. This event was a bit challenging because of the weather and our expition was remarkable. Napahaba, pero nagustuhan ko yung part na yun. Why? Parang kinulang ang socials natin nung gabi and the expidition was the second part. To those people we met, it was nice to be with you. To my constituents, friends and countrymen, Maraming Maraming Salamat sa inyong pagsuporta! Lakas maka graduation speech no?? Hanggang sa muli. HOW TO GET HERE? I can't provided a DIY itinerary because it's an event. But, if you have questions, just LIKE my facebook page and send me a PM, click here. Sent a PM. Just have a few questions. Thanks! Will be there next weekends. Question also sent to Sirang Lente fb page.